It’s no secret: the kitchen is likely the hardest-working room in your house, and if you ask us, it should be one of the best looking, too. That’s why, when it comes to kitchens, we like to show off a little. At Marshall Homes, we’re not about run-of-the-mill, cookie-cutter kitchens. For our detached homes, custom homes and cottages it’s all about custom. In fact, we encourage our customers to go right to the source! We’ve teamed up with custom kitchen wizards AyA Kitchens to make sure the kitchen in your Marshall Homes home looks great and functions even better. We’ll help you pick one of our customizable plans then if you’d like to customize your kitchen to fit your tastes and your life, and we’ll make them happen. Thankfully, in the world of custom kitchens, there are nearly endless options for adding beauty and smart function to your kitchen. With so much happening in the kitchen, from food prep to entertaining, it should be a space you and your guests gravitate towards day after day. How to make sure that happens? Choose the right finishes; they can transform the vibe of the room. When it comes to countertops, granite has been the go-to for years, and it’s a solid choice. (See what we did there?). But there’s a newcomer on the scene shaking things up. Quartz comes in an impressive range of colors, from neutral grey to bold blue, and finishes, from sleek and shiny to matte and suede-like. Go traditional with a rounded or reverse waterfall edge or more contemporary with a raw-edge look. Super durable, it resists scratching and cracking, and unlike natural stone, it’s virtually maintenance-free, with no need for regular sealing. In the world of backsplashes, tiles are still a mainstay, but think outside the ceramic box and opt for natural stone or mirrored surfaces for an extra boost of style in your custom kitchen. While clean and classic white subway tiles will always be a winner in the kitchen, patterns (think: hexagon, chevron and herringbone) are coming on the scene in a big way. (That little pop of pattern looks fab against a neutral quartz countertop.) Or, if you’re feeling extra adventurous, foray into metal—a pretty hammered copper is a popular option—or choose a colored backsplash to add a pop of personality and color into an otherwise neutral space. For flooring, hardwoods are always in style. Keep them fresh by choosing the right finish. Opt for a grey-toned driftwood look with a bit of texture, if you’re looking for something low maintenance and less fussy. The only hard and fast rule here? Stay away from the warm, honey-toned shades and anything too glossy. You can’t go wrong with neutrals; they’re timeless. And for a really current look opt for greys and light coloured white oak. Fixtures serve a largely utilitarian purpose, but they should up your style quotient, too. Think of them like a statement piece for your kitchen—an accessory that can pull together the whole look of your space. Brushed nickel and stainless steel are a safe choice when it comes to fixtures, but if you’re hoping to keep your selections up-to-the-minute try gold or flat black. These aren’t your grandmother’s dated, overpowering, overly-shiny and, well, overly-brassy fixtures. The updated versions are understated and modern, hinting at luxury. As for cabinets, the trend is clean and simple. The shaker is still a very popular look as is the more modern slab door. Ornate detail has gone by the wayside in our casual lifestyles. Warm whites lend a neutral, timeless feel and complement most décor. 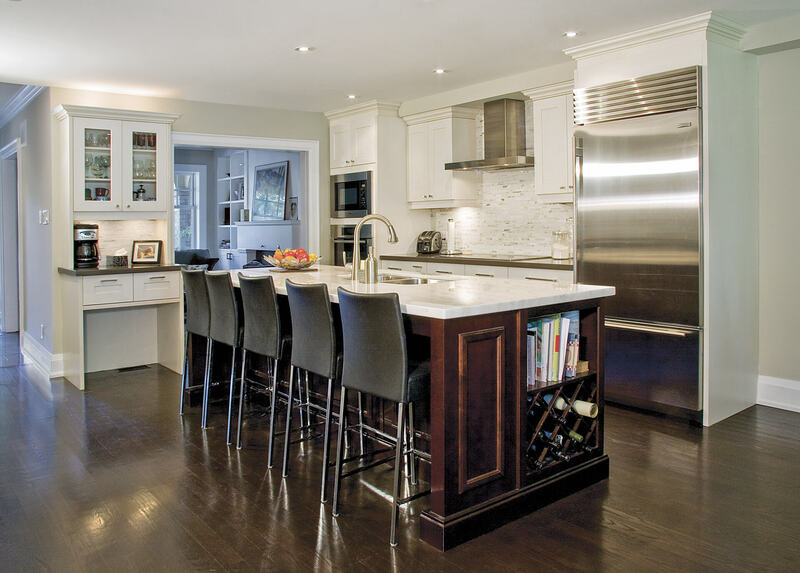 A contrasting island gives the kitchen interest and can tie into adjoining rooms. Think greys, navy or driftwood to give your island that wow factor. 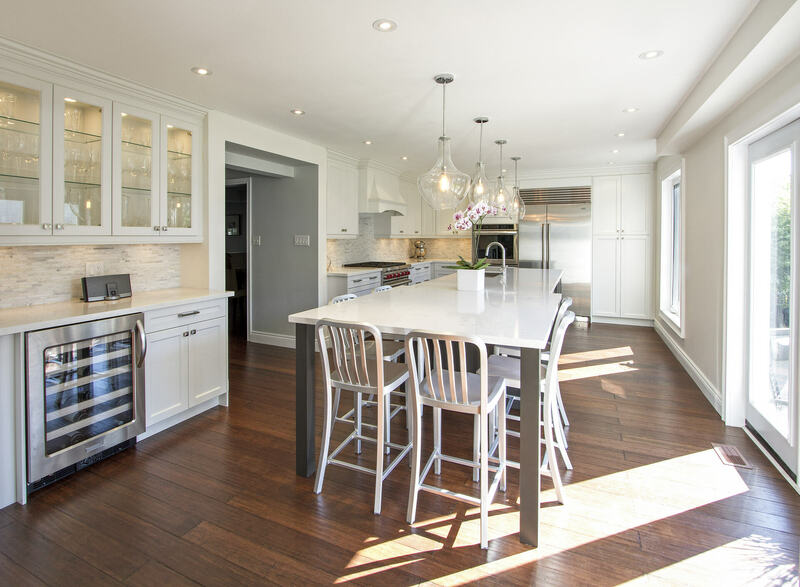 With open concept being a mainstay in home design, the look of your kitchen needs to meld seamlessly into the rest of your decor. That means the clutter on the countertops has to go. Because who wants to see the blender you used to make smoothies in the morning while entertaining over cocktails in the evening? Since you can’t just ditch those kitchen appliances, storage solutions are clutch. When you design a custom kitchen with us, your built-in storage choices are nearly endless, from pull-out drawers for storing heavy pots and pans to cookie tray and cutting board cubbies and hidden waste cabinets. Beyond the basic storage components, you can opt for a servery, the perfect spot for entertaining buffet-style. Or, use it as a built-in drink bar to make easy work of mixing those pre-dinner aperitifs or prepping coffee in the morning. If a walk-in pantry to keep all of your appliances and ingredients concealed but handy is in your dream kitchen, we’ve got you covered there, too. Ready to start creating the custom kitchen of your dreams?